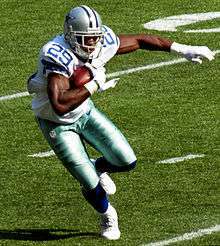 LaDainian Tomlinson led the league in 2006, and set the NFL record for most rushing touchdowns in a season, with 28. This is a season-by-season list of National Football League players who have led the regular season in rushing touchdowns. Although rushing has both an offensive and a defensive meaning, this list charts offensive rushing touchdowns, usually scored by a running back, either a halfback or a fullback. Record-keeping for rushing touchdowns began in 1932, when Bronko Nagurski of the Chicago Bears led the league with 4 rushing touchdowns. Since then, LaDainian Tomlinson has set the record for rushing touchdowns in a season, when he led the league in 2006, with 28 rushing touchdowns, while playing with the San Diego Chargers. Prior to Tomlinson's setting of the record, Priest Holmes of the Kansas City Chiefs and Shaun Alexander of the Seattle Seahawks, jointly held the record with 27, reaching that mark in 2003 NFL season and 2005, respectively. Jim Brown holds the record for most league-leading seasons in rushing touchdowns, with 5 (1957, 1958, 1959, 1963, and 1965). Dutch Clark became the first player to lead the league in consecutive seasons (1936 and 1937), although in 1937 he co-led the league. 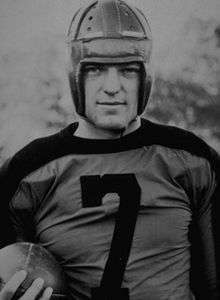 The first sole rushing touchdowns leader in consecutive seasons was Johnny Drake, when he led in 1939 and 1940. Steve Van Buren was the first to lead the league in 3 consecutive seasons, from 1947 to 1949, a figure later matched by Jim Brown (1957 to 1959) and Leroy Kelly (1966 to 1968). Marcus Allen is the only player in NFL history to lead the league in rushing touchdowns while playing with 2 different teams; in 1982, Allen led the league while playing with the Oakland Raiders, and in 1993, he led the league while playing with the Kansas City Chiefs. 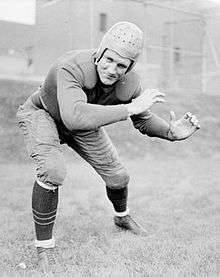 In 1943, Bill Paschal became the first NFL player to post a 10+ rushing touchdowns season, when playing for the New York Giants. 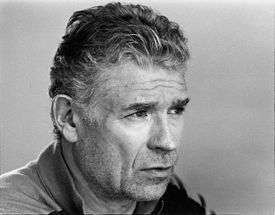 40 seasons later, in 1983, John Riggins posted the league's first 20+ rushing touchdowns season. Steve Van Buren was the first player to lead the league with consecutive 10+ rushing touchdowns seasons, in 1947 and 1948; he would add a third consecutive in 1949. Emmitt Smith posted the first consecutive league-leading 20+ rushing touchdowns seasons in 1994 and 1995–an achievement later matched by Priest Holmes, in 2003 and 2004. 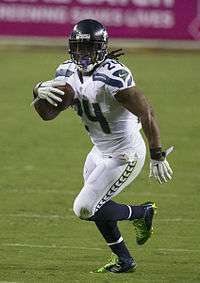 1 2 "NFL Year-by-Year Rushing Touchdowns Leaders". Pro-Football-Reference. Sports-Reference. Retrieved October 15, 2014. ↑ "LaDainian Tomlinson breaks single-season touchdown record". History. Retrieved October 15, 2014. ↑ Peticca, Mike (July 29, 2013). "Cleveland Browns' 100 best all-time players: No. 2, Jim Brown (video)". The Plain Dealer. Cleveland. Retrieved October 15, 2014. ↑ Dean, Rick (January 5, 2004). "High Priest -- KC's Holmes tops pair of NFL charts". The Capital-Journal. Retrieved October 15, 2014.